Victor Sistré idly watched the traffic around Manatirid station on his radar. Most of the cargo freighters were Gallentean ones, but the police vessels were from the Amarr Empire. Manatirid station was located in one of the few Amarrian systems close to Gallente space, and as such acted as a trade post between the two empires. Victor was on a mission for his corporation, searching for rare minerals to use in the corporation’s shields production. A ship undocked from Manatirid station and Victor immediately noticed the radar signal depicting the newcomer as hostile. It was a ship from Jaasinen Inc., a rival company of Victor’s Canout corporation. The two corporations were at war, their dispute revolving around a system far from Victor’s current location. Even if the Amarrian system was a lawful place the fact that the two corporations were officially in a state of war meant that Victor was a free target for the Jaasinen frigate fast approaching. Victor quickly activated his warp drive, having no intention of fighting the Caldari frigate on his lightly armed ship. But before he could finish selecting a destination for his warp he noticed that the Caldari had scrambled him, preventing him from entering warp. Victor veered his ship away from the Caldar vessel, the range still a good 10 kilometers. His ship computer registered a couple of missiles being launched, but their e.t.a. was still some seconds off. In the meantime Victor activated his anti-scrambling unit - due to the strength of the Caldari scrambler it would take a full minute to de-scramble the warp drive. Ruefully reflecting on frail defenses, Victor longed for his heavily battle-equipped Incursus frigate. Just before the two Caldari missiles slammed into Victor’s ship he launched a couple of salvos of his best counter-measures in response, hoping to foil the missiles. One of the missiles was fooled into exploding its warhead some way from the hull, but the other stayed its course and smacked into Victor’s ship. The shield managed to absorb a fair deal of the damage, but to Victor’s dismay the powerful missile had still managed to breach the armored hull. Two more missiles were launched from the Caldari ship and Victor wondered how many the Caldari captain had. He himself had already spent his best counter-measures and he had no anti-missile missiles or point-defense weapons to deal with the approaching menace. Victor resolved to dug deeply into his power reserves by boosting his shield a couple of times, hoping it could sustain the damage from the missiles. While waiting for the impact Victor zoomed his camera onto the missiles and noticed their brand - each of these missiles was almost as expensive as the whole of Victor’s ship. It was obvious that the Caldari was out to destroy him for a bigger reason than just to loot his cargo hold. The missiles crashed into Victor’s ship, jolting it around. Victor could feel the impact in his own bones, a sure sign that the ship had received major damage. A quick survey of his ship computer revealed several hull breaches and some structural damage. The hydraulic system was out-of-order and his oxygen level was dropping fast, indicating a hole in an oxygen tank. 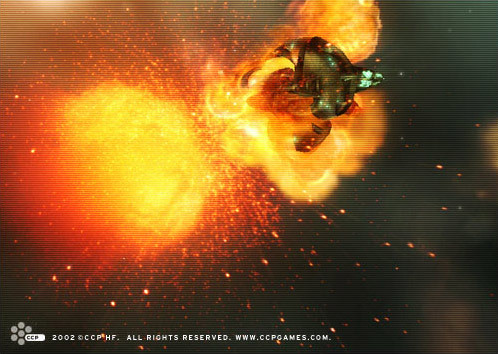 The Caldari ship, being considerably faster than Victor’s ship after having activated its afterburner, was now close enough to open fire with its short-range lasers. The last missile impact had severely reduced the strength of Victor’s shields and his power level was low. The anti-scrambler still needed 20 seconds to complete the de-scrambling and it was eating into Victor’s remaining power supply. Victor forlornly realized that the Caldari had expended almost no power so far - only on the warp scrambler and a small amount on the afterburner. Only now was he using energy weapons against Victor. As Victor’s capsule was ejected from his disintegrating ship, Victor wondered whether skipping the anti-scrambling and burning for the station might have been a wiser choice in the situation.